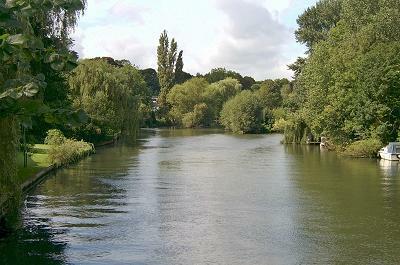 Pangbourne is where the River Pang joins the Thames. Its most notable resident was Kenneth Grahame, author of “The Wind in the Willows”. The sign for the village portrays the book to emphasise the connection. It is a little presumptuous of Pangbourne to claim Grahame as one of its favoured sons, because he only spent the last few years of his life here, and he had already found fame with his book before his arrival. Kenneth Grahame was born in Edinburgh, but during his childhood he moved to live with his grandmother in Cookham, following the death of his mother. He attended St Edwards School in Oxford and wanted to go on to Oxford University. His grandmother had other ideas and sent him to work at the Bank of England. He worked diligently at the bank and his career developed well. By the time he retired due to ill health he had risen to become Secretary of the Bank of England. Grahame had several stories published in various London periodicals, one of which, “The Reluctant Dragon”, was turned into a film many years later by the Disney Corporation. It was in 1908 that his most famous creation was published. “Wind in the Willows” tells the story of Ratty and Mole, who spent their days “messing about” on the river. Their lives are changed when they meet the conceited and wayward Mr Toad and they become swept up in many adventures as they attempt to save Mr Toad from himself. The book made enough profits for Kenneth Grahame to retire, and he moved out of London to be near his beloved Thames, finally moving to Church Cottage at Pangbourne in 1924, where he lived out his final years until his death in 1932.